Amara is no stranger to travel. She and I have been travel companions since she was a toddler jet setting to Honolulu. We have taken the turnpike to Chicago and canoed the Hocking River since my divorce. Yet, something just feels different about this vacation. Inspired by the blog 40 Days of Dating (ironic, I know), I wanted to chronicle this trip differently. I already said I was taking a digital hiatus - but that doesn't mean I don't want to journal every moment I have with Amara and Trixie. My daughter is a gifted writer. Her perspective when it comes to photography really surprises me at times. And this blog does have her name in it. So it only seems fitting I ask her to post along with me, right? So today, you get to see how we did on our road trip to the Jersey Shore! I drove eight hours with a very restless Jack Russell Terrier and a crazy tween. But as soon as we hit the Garden State Parkway, we rolled down Foster's windows (yes my car has a name) and took in the ocean air. An oceanside motel is exactly what you would expect, no matter where you travel. 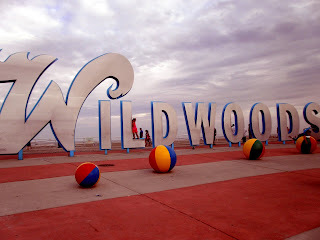 Wildwood, New Jersey, is known for it's kitsch and doo wop culture. The 1950's-surf's-up-motel feel is pretty awesome. But if you're a hotel snob, renting a house may be a better way to go. I'm hoping to find some good local eats. We stumbled upon the Hound Dog at the Doo Wop Diner on the Boardwalk, and oh. my. gawd. Provolone cheese and bacon on a kosher beef hot dog...you know I will be back to indulge! The last time I remember seeing Amara this giddy was our first trip to Disney. She stepped foot on the Boardwalk, and she stood wide-eyed, amazed at all the activity taking place. 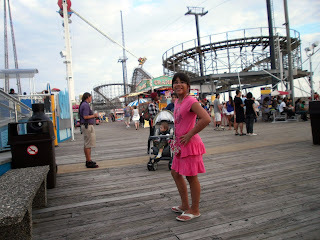 Arcade games, rides at Morey's Piers, shops galore - she wanted to take all of it in. We struck up a conversation with Diane, a manager at Morey's, and I admitted I'm a Cape May girl. She immediately looked at Amara and said, "you're a very smart girl. Wildwood was your idea, wasn't it? Cape May is boring!" Well played Diane. Well played. 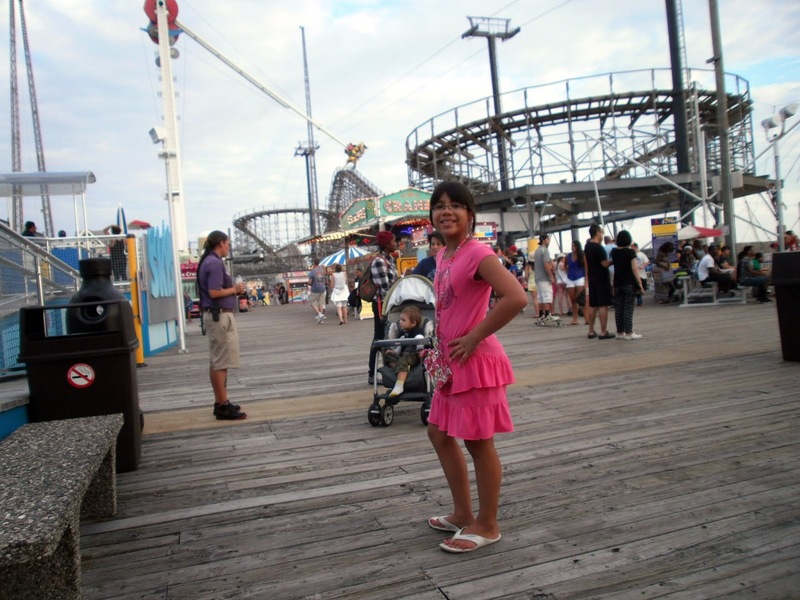 Wildwood, I'm guessing Amara will be a Jersey Girl by week's end. We walked on the boardwalk and played games. We went to arcades and I got a lot of tickets and played darts and won a gingerbread man. I learned that people who work at gas stations in NJ have to pump your gas for you. We went to a gas station before we got to the motel and I experienced it for the first time. A must-do is going to the Doo Wop Diner because we want there for dinner and it was delicious. I recommend the Hound Dog Hot Dog and the Cookie Dough Milkshake. I wanted to take old time photos at the boardwalk. I was going to dress up as a Victorian girl in a cute dress. My mom learned something today too. I can do darts! She never knew that.